I had the unexpected pleasure of having lunch together with both Ambassador Kwon Byong Hyon and Dr. Kwak Sang Soo at Future Forest last Friday (August 8, 2014). They are two Koreans who have deeply inspired me with their model and their work. Ambassador Kwon works every day to raise funds to support efforts to plant trees in China and stop the spread of trees. He is one of the very few who is deeply involved in government policy but also willing to think outside the box about the need to create a new civilization in this age of ecological crisis. He is far past the age that most successful people retire and take up their time with personal concerns. When we spoke at Minjok Sagwan High School, Ambassador Kwon started his remarks by apologizing to the high school students for how he had thoughtlessly wasted resources throughout his life without a thought for future generations. I have never heard anyone one make such an apology before, and, in fact, I have never made that apology myself. I should, however, perhaps every time I meet someone younger. I was deeply impressed and honored to be at the lunch with Ambassador Kwon–who has been a close supporter of Asia Institute. Dr. Kwak has worked ceaselessly with Chinese (and people of other countries) to develop foodstuffs that allow poor people to feed themselves without damaging the ecosystem. He has made tremendous contributions—which most people do not know about— to the battle to stop the spread of deserts in Northeast Asia. The spread of deserts is the greatest threat of our age and Dr. Kwak identified it early on. I would also like to draw attention to someone not pictured here. That is Dr. Chen Minhao who passed away in 2009. Dr. Chen Minhao was a Chinese academic who fought endlessly for the cause of ecology in China in an age when few were interested. Although I did not understand what he was talking about when he told me about his ideas back in 1991, I later came to understand that I had met another remarkable spirit. I had the honor of translating his thoughtful proposal for a Nobel Prize for ecology to stand beside that for economics. Do see my short essay on Dr. Chen Minhao. 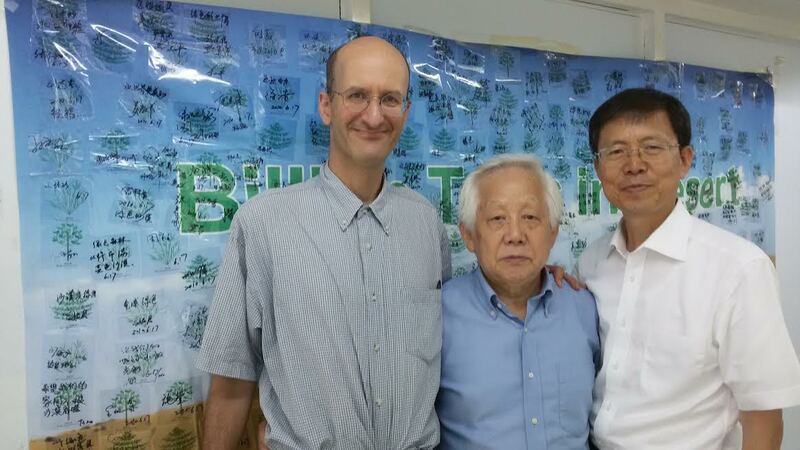 Emanuel with Kwon Byong Hyon (center; former Korean ambassador to China and Chairman of Future Forest) and Kwak Sang Soo (senior researcher at Korea Research Institute for Bioscience and Biotechnology on August 8, 2014 at Future Forest offices in Seoul.